Using the Safari browser on your iPad mini, you can search the web via the Google, Yahoo!, Bing, or (with a Chinese keyboard enabled) Baidu search engines. 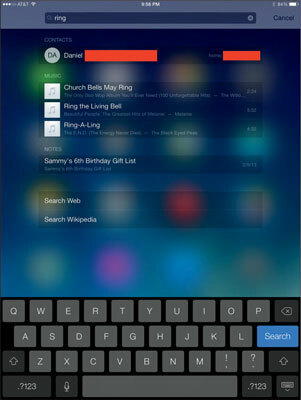 But you can also search for people and programs across your iPad mini and within specific applications. Swipe down from any Home screen to access Spotlight. Don’t swipe from the very top; otherwise you’ll open Notification Manager instead. Tap the bar at the top of the screen that slides into view, and enter your search query using the virtual keyboard. The iPad spits out results the moment you type a single character, and the list narrows as you type additional characters. The results are pretty darn thorough. Say that you entered Ring as your search term. Contacts whose last names have Ring in them show up, along with friends who might do a trapeze act in the Ringling Bros. circus. All the songs on your iPad by Ringo Starr show up, too, as do such song titles as Tony Bennett’s “When Do The Bells Ring for Me,” if that happens to be in your library. The same goes for apps, videos, audiobooks, events, and notes containing the word Ring. Tap any listing to jump to the contact, ditty, or application you seek. In Settings, you can specify the order of search results so that apps come first, contacts second, songs third, and so on. At the very bottom of the Spotlight results list, you can tap to move your search query to the web (using your designated search engine) or to the Wikipedia online encyclopedia.